I know this blog has been vacant for sometime now. Life gets in the way like that at times. However, it has been calling me back. I miss blogging about my creative life. I miss that interaction with everyone, because you know what? We inspire each other! I am prepping for Bead Fest Philly again, and have been hitting the polymer clay after a bit of a hiatus. I am both intimidated and excited. 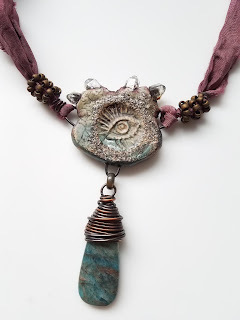 This year I have some new work that mixes polymer clay with two part epoxy resin and crystals- I must say, I am loving these so much! Due to life's complexities, I know I am not going to have the amount of beads I like to at Bead Fest this year. I do know I will have enough. I used to freak out and work 16 hours days prepping for this show making everything I know how to. This year, I am focusing on making what my heart is telling me to, rather than what I think others would want to buy. 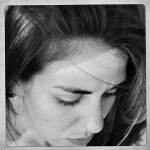 I am listening to my intuition. I will have a table full of unique items for sale in addition to my beads, like I have in the past. 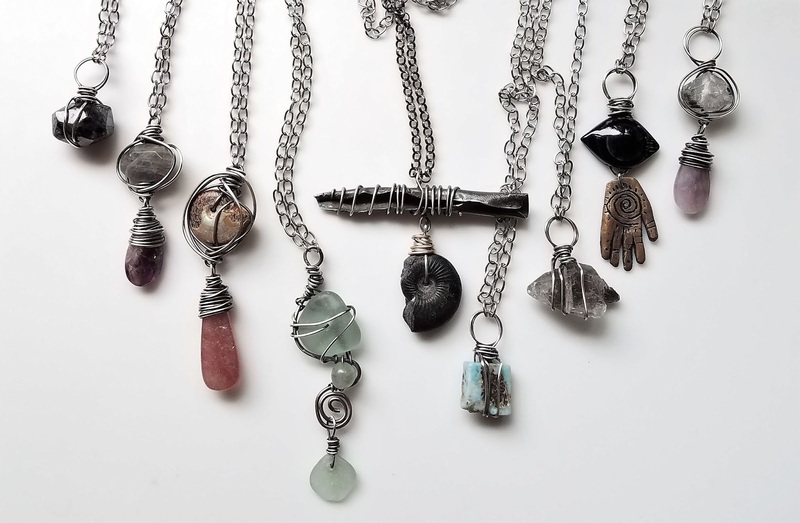 I will have my jewelry, ceramic offering bowls and other things. You can find all that event info here on my Facebook page. Please follow it if you have not in the past. 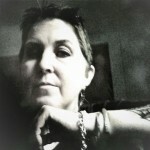 It is the best place to keep up with where I will be and what is going on in my creative world. I also recently finished converting y Gold Rush class I did for Craft Art EDU into a PDF file you can purchase in my shop. 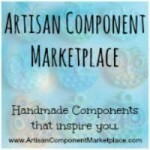 I was so very sad to see Craft Art EDU disband, but I am thankful they gave us our classes. The tutorial is an entire class in one! 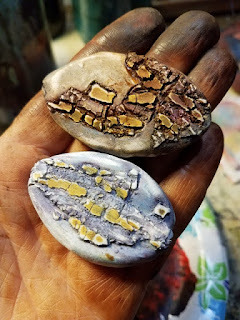 You learn to form the polymer clay beads, do the faux gold, cure and paint them with a crackle to make them look like stone, and then it even gives complete instructions to make two different necklaces. You can purchase that here if you are interested in learning some techniques. The best part is that this class is so full of different techniques and tips, you can use them many different ways. I really believe this class can take you on a creative journey to new places! Well guys, it feels good to be back! 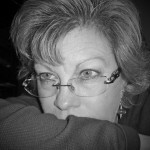 I am hoping to also do some posts to highlight some of the wonderful tutorials we have on this blog. Click the tutorial link above to see a list of all the wonderful tips and designs posted by various artists over the years. 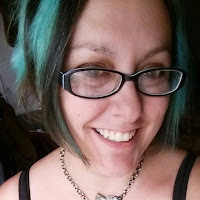 It has been a long time since any of us have blogged on here. This year has been taxing for many of us, and life is just busier with more important things at the moment (family always comes first!!!). I have taken some time this year to play and lightend up my schedule. I am not doing spring and summer shows, so that I have time to work on other things and spend more time with the family. 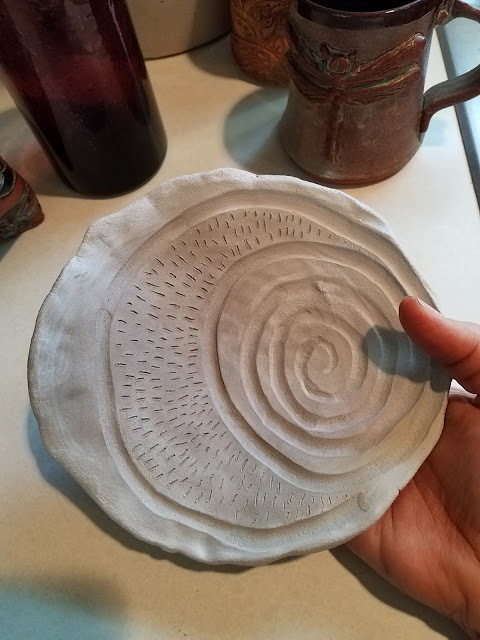 I took some time on our beautiful spring day yesterday to get out my ceramic clay. 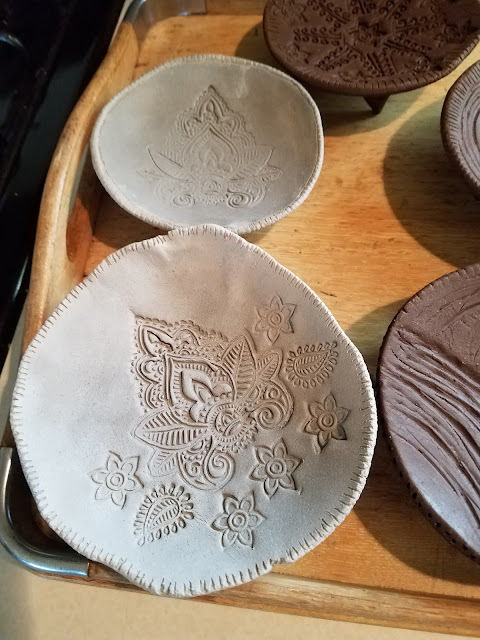 I have been wanting to make something bigger than beads with my clay, so I thought I would make offering bowls. I don't do anything formal as far as alters or offerings, but I do have little "alters" to nature of sorts all over my house. I love little dishes full of natures treasures in all parts of my home. This one is a polymer clay dish I made, on top of a huge slab of petrified wood. 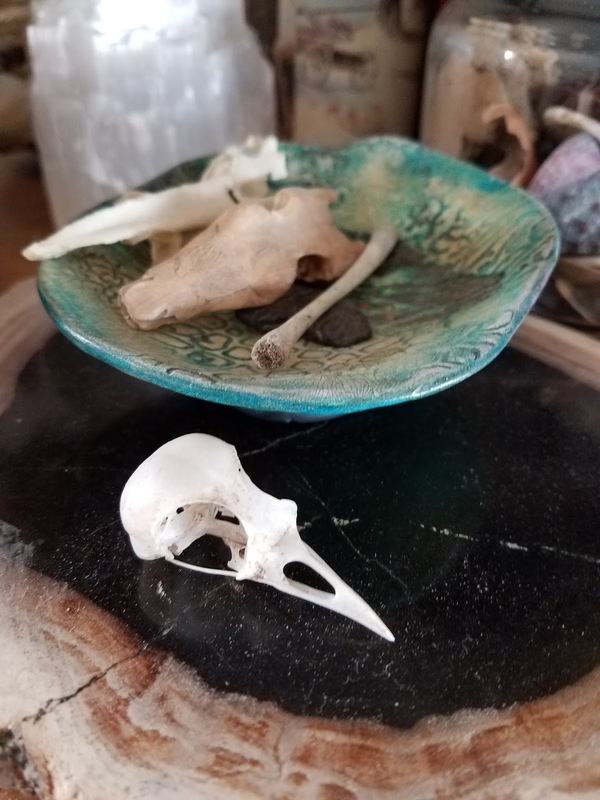 In it are bones and skulls that my youngest son has collected on our travels. 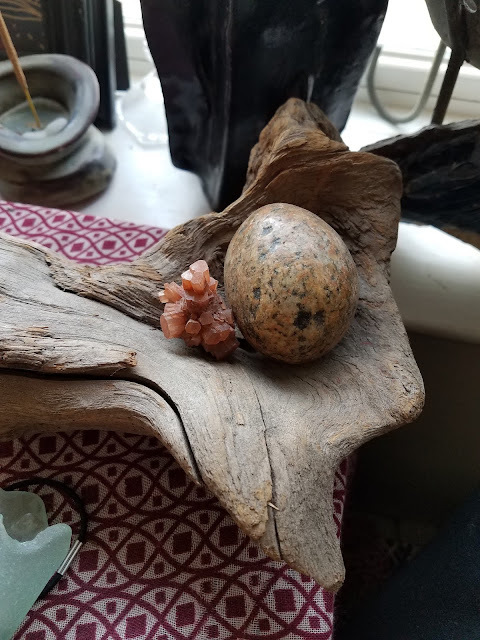 This bowl is a piece of natural driftwood, to which I added an awesome stone that is very round, and a piece of arragonite. 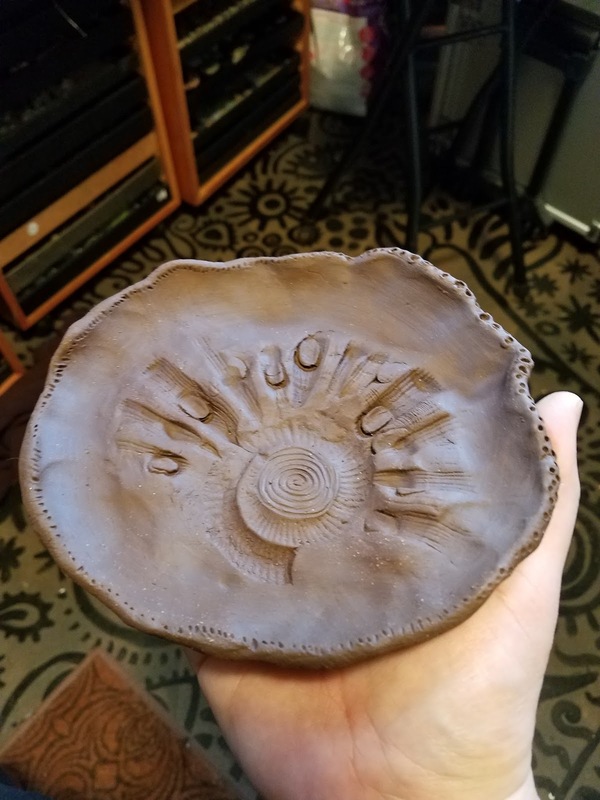 This cool bowl is actually a rock I found in upstate PA. It has a natural concave shape, as if it were part of a large hollow form. 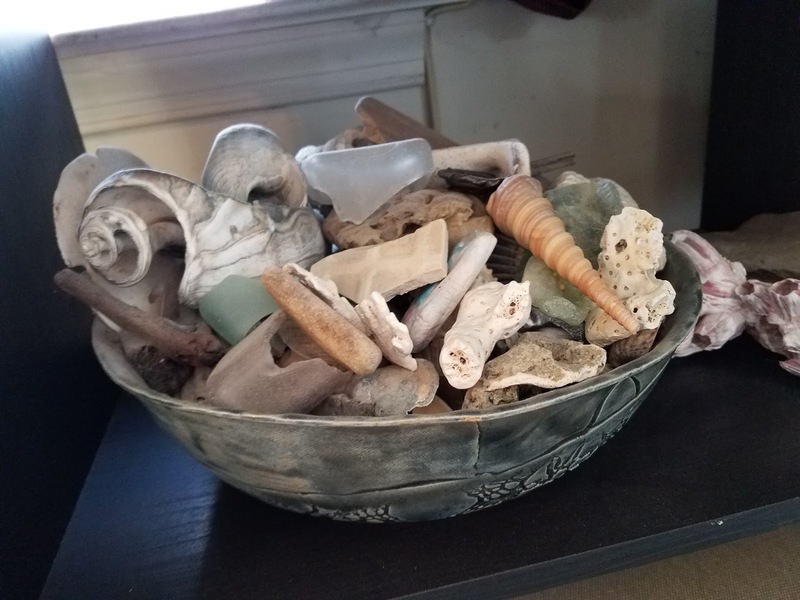 Inside is little sea treasures we have found in NJ, including the horse tooth. 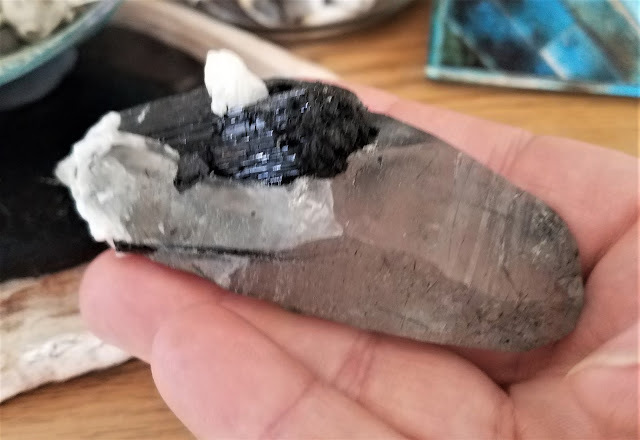 I have also been collecting some really cool crystals, and would like a place to show them off. This specimen is tourmalated quartz (aka rutilated quartz). It is one of my favorite stones to use in jewlery. So it was REALLY cool to see this- which is tourmaline, in the middle of being encrusted into the quartz. I am so fascinated by stones. 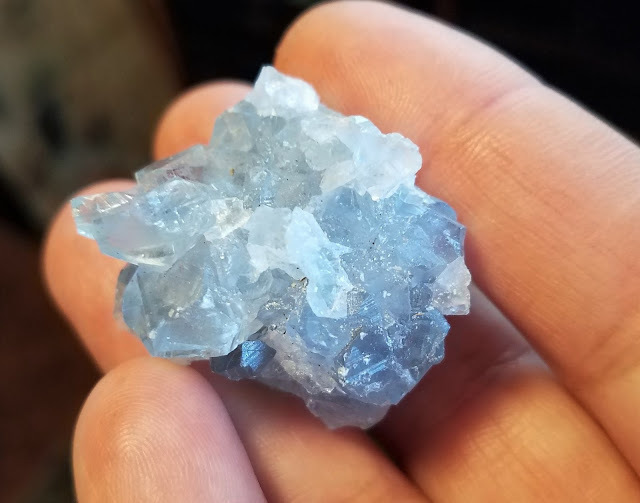 This little guy is a most heavenly blue- and its called celestitie. 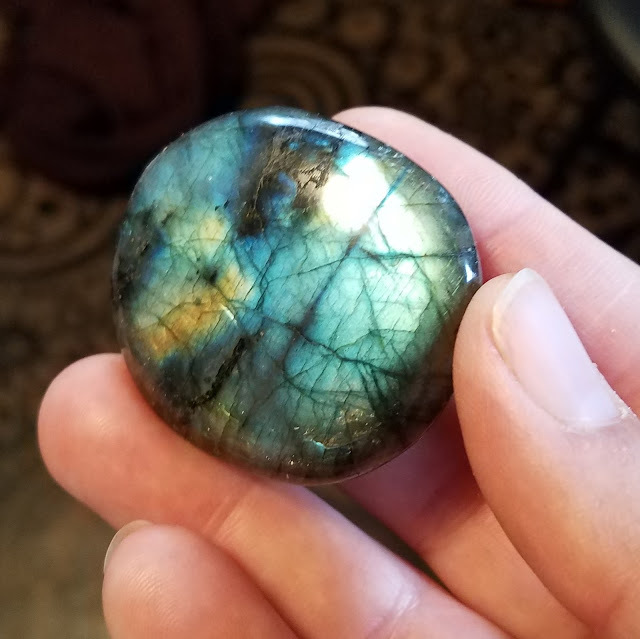 And how could I resist this labradorite? 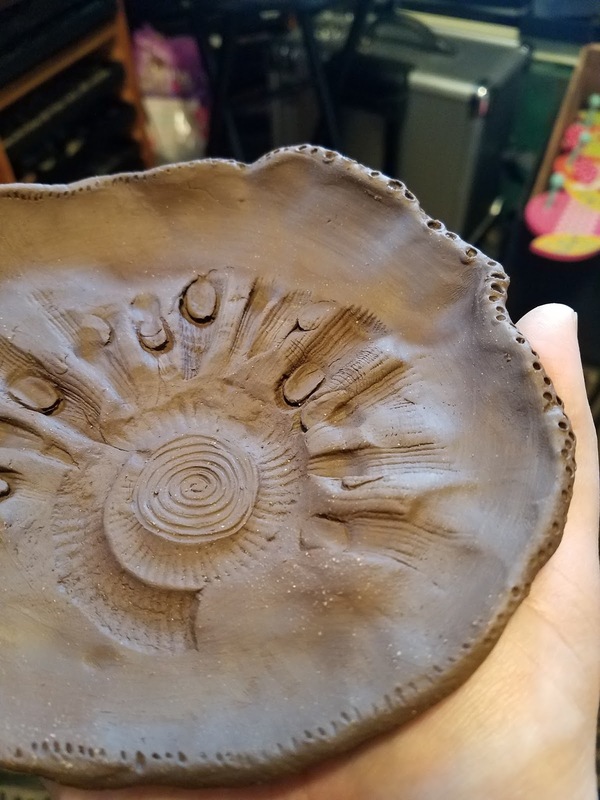 I put little legs on some of the bowls, because I really like how it looks. It lifts up whatever you want to display on it. I made a couple of larger pieces, like this one. I didn't add any feet to them, and I think I love the feel of them the best. 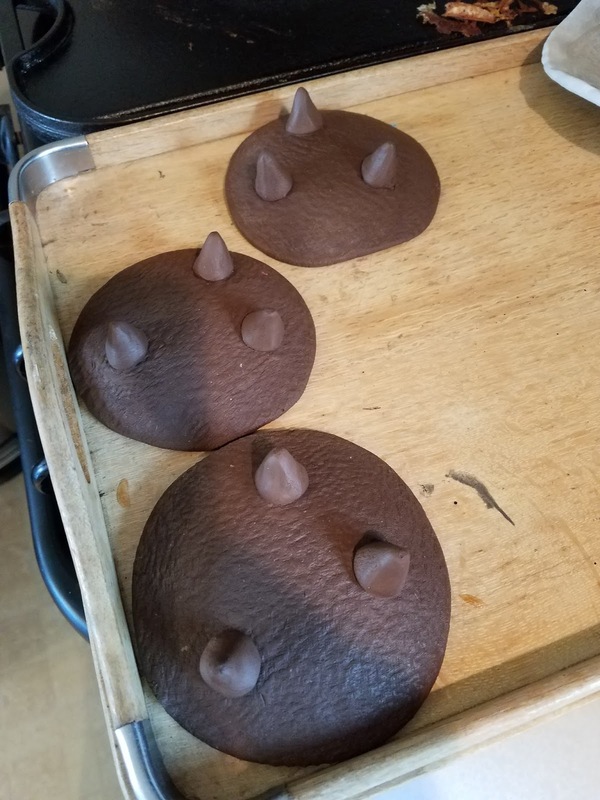 They turned out very organic. I did some stamping on some as well, and then went in with hand embellishing them further. Of course, this is my favorite. I plan to keep it, but I will make more similar bowls today. I love the organic feel of it. 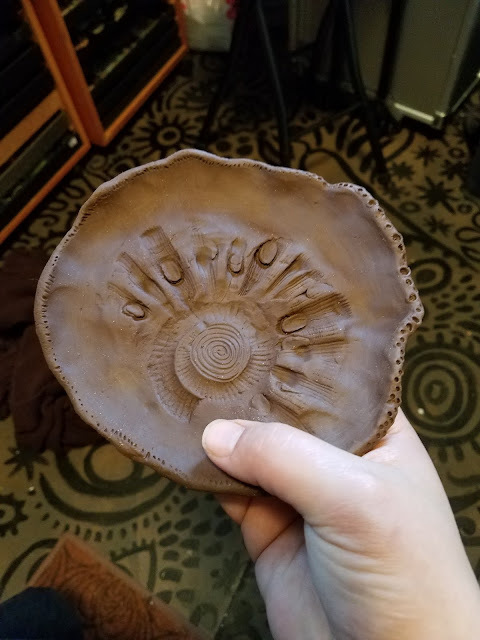 I used a cool shell and fossil to make the imprints, and then added my own touch with the spiral center and designs around the edges. I simply cannot resist things that look as if they were dug up from the earth. There is something about a piece with history that gets me every time. I cannot express how fun it is to dabble in a new medium now and again. 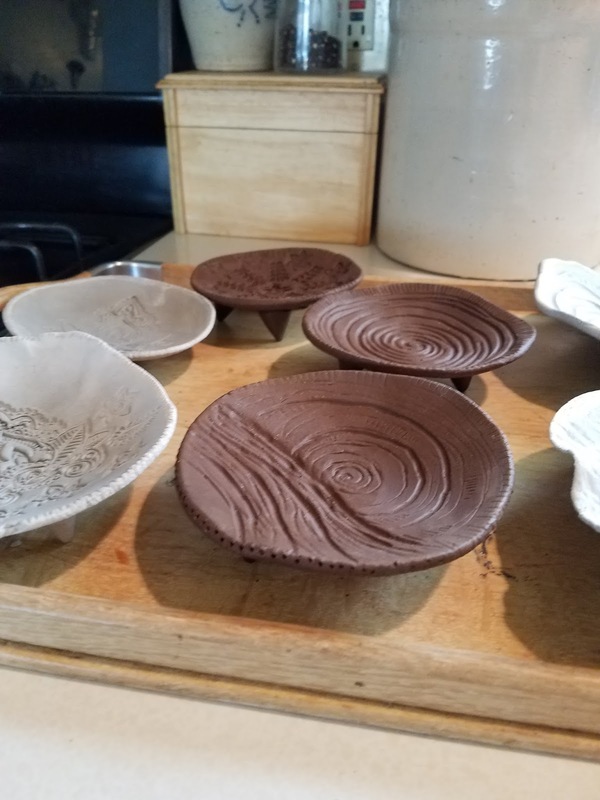 My daughter joined me and she made some bowls too. It has been equally wonderful to be able to spend so much more time with the kids. I really missed that and didn't realized how much I worked until I didn't. I still need to keep $$ coming in though, so, I am still producing, and some of these will be for sale as well. So stay tuned. You can follow my facebook page for updates to see when they are available. 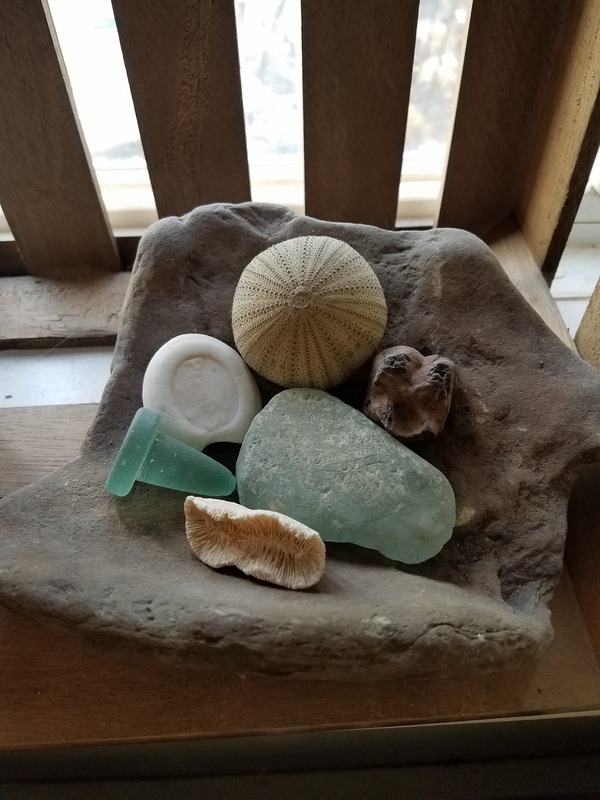 Do you have "collections" of items around your home? Do you arrange your art and findings into little alters in your home? Share your hoards of collections with us on the Love My Art Jewelry Facebook!!! page! Personally, I have an affinity towards handmade beads - all mediums. I don't know about you, but I cannot count the number of "subscribed lists" I have signed up for to arrive in my email inbox, but I do at least glance at each and every "blog type" email that pops up in my mailbox feed -- always on the lookout for inspiration.. One of my favorite's is the Interweave Blog. 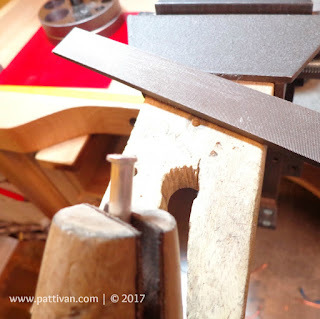 A couple of weeks ago, Tammy Jones had a post related to 1-hour rings. 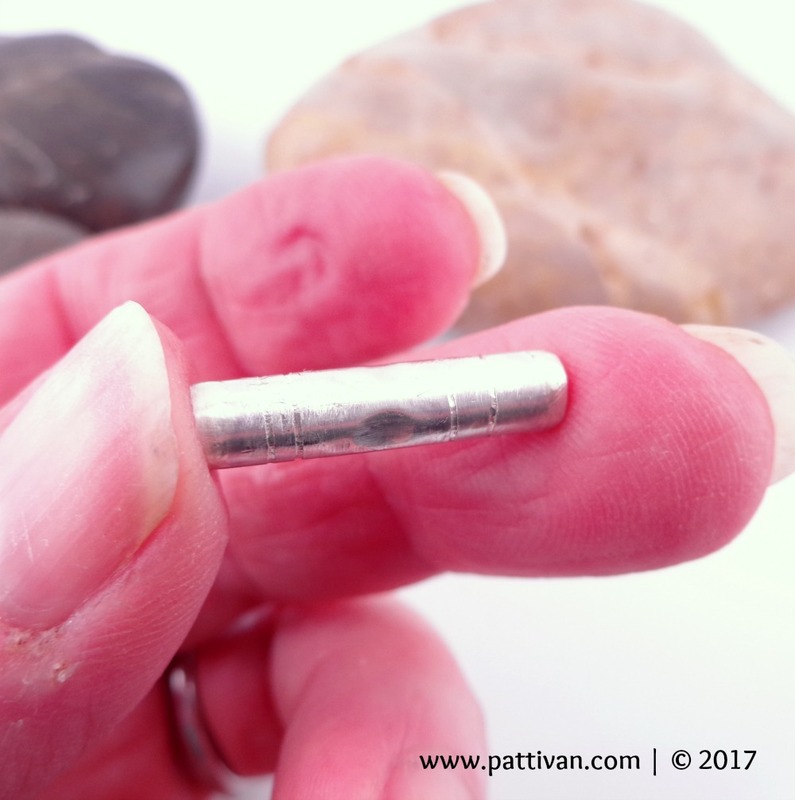 In this post was a quick, down and dirty tutorial to make a sterling silver ring that resembled bamboo (if interested, here is the link to that blog post). 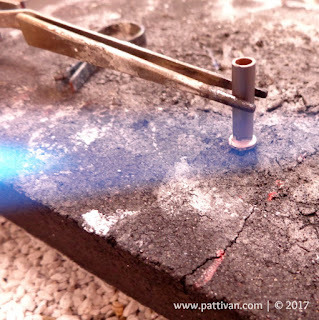 The tutorial (by artist Elizabeth Ann Tokoly) starts with a sterling silver ring already soldered and formed. 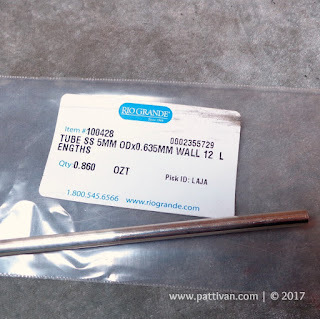 After reading through the steps involved, I felt a thick gauge wire would work best - so I grabbed 6 gauge. 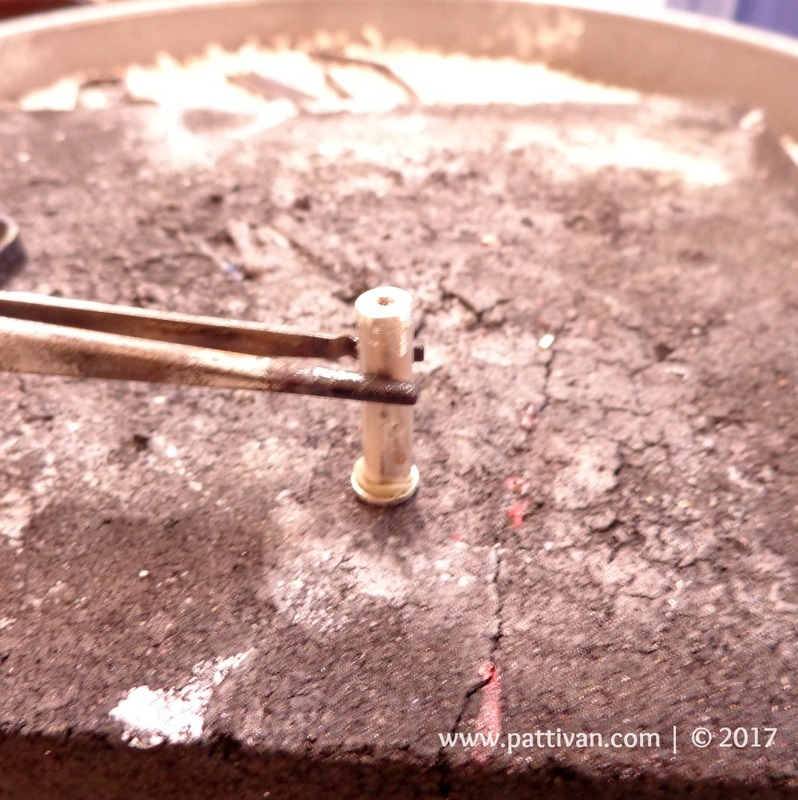 I will say, the making of this ring took me 1 hour and 45 minutes - but that included forming the ring from such heavy stock - I had to anneal the metal several times just to get it formed for soldering. 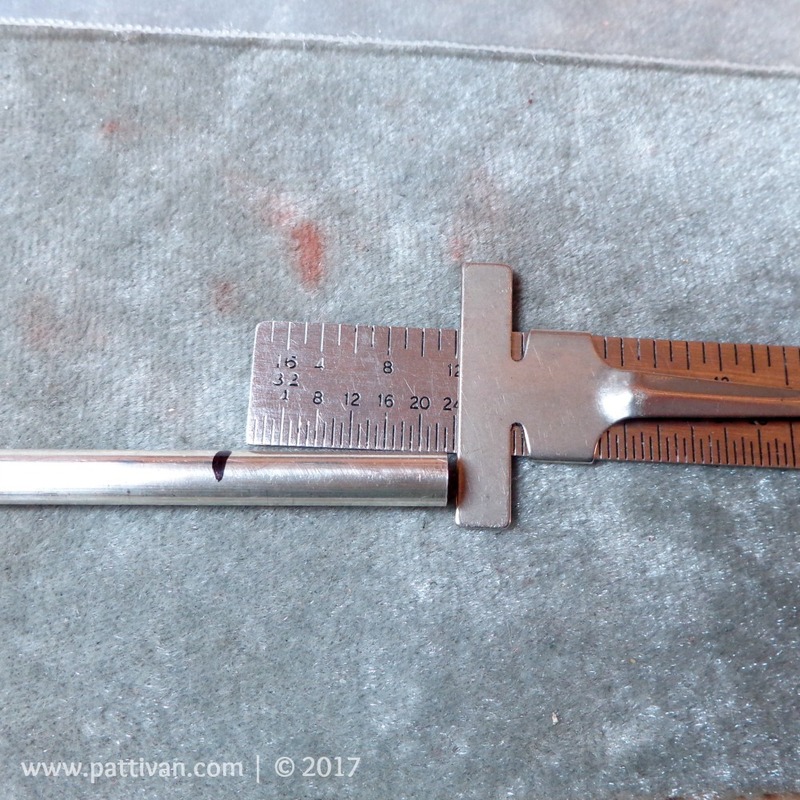 And then anneal several more times AFTER the soldering to get it round and to the correct size (why didn't I just grab 8 gauge?) :) Also, it is a bit cumbersome to saw the score lines around the ring - but it can be done. Anyway, it is a COOL ring, which I have gifted to a friend. (Forgive the picture quality - I just took a quick picture for reference purposes only). 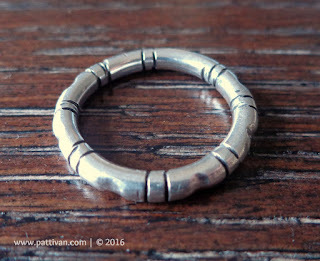 This technique would be AWESOME for a bangle - which I will try in the future. 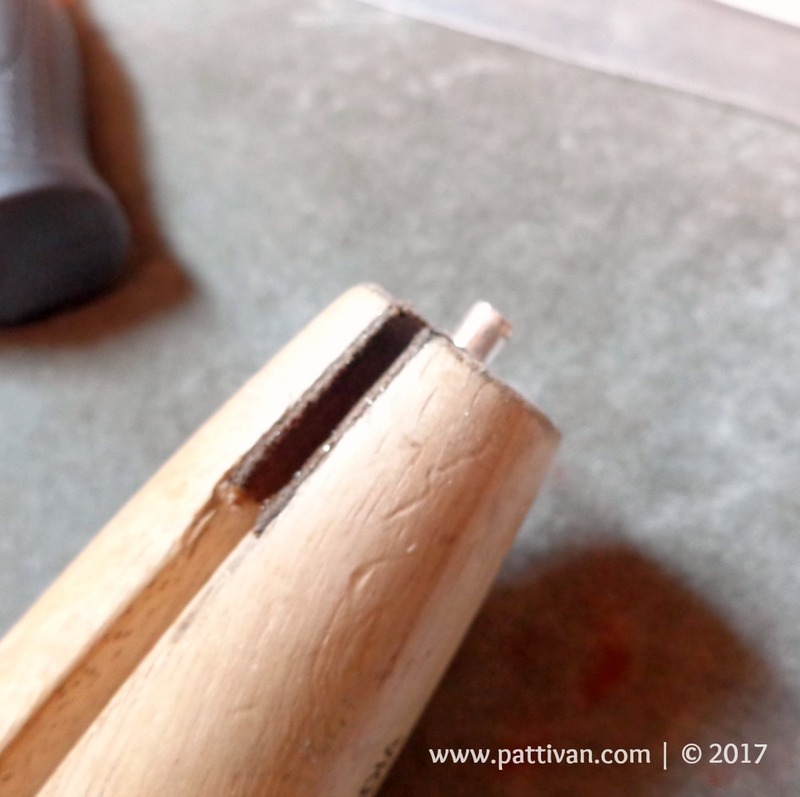 In the meantime, I thought I would try making a little bead using this technique. 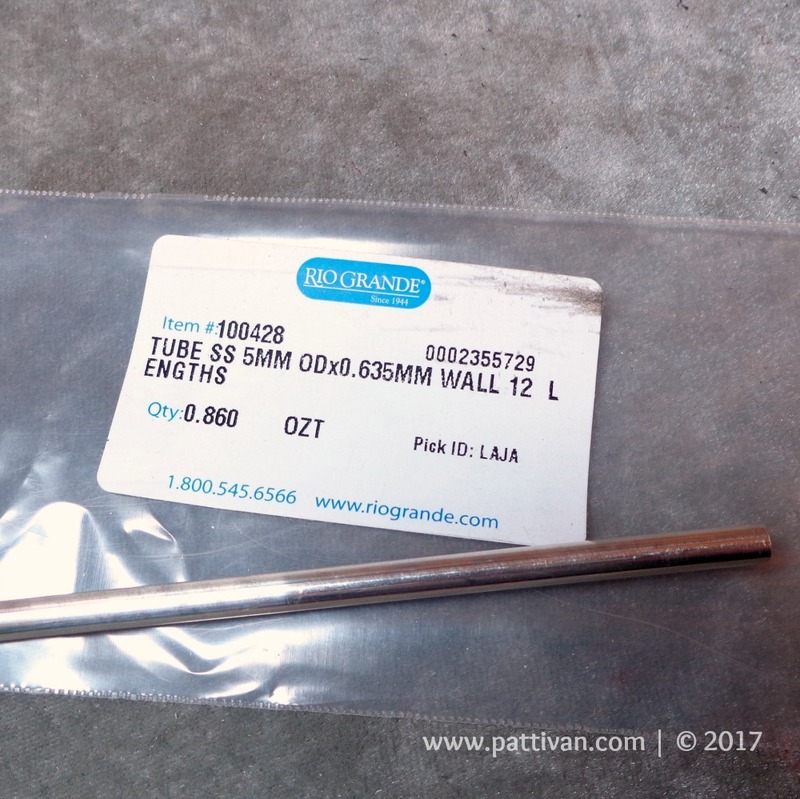 For this bead, I grabbed some thick-walled sterling tubing. 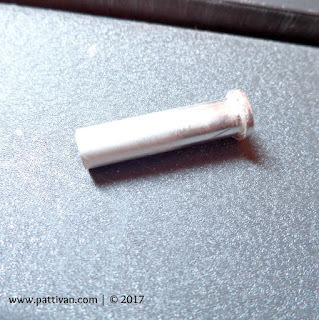 I roughly measured the bead length to 3/4". 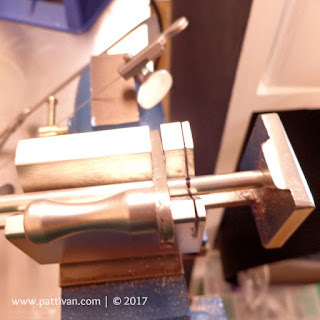 Cut the tubing to size using my tube cutting jig and jeweler's saw. I made two little "end caps" for the bead by using my disc cutter and some scrap silver sheet - it's 18 gauge sheet, so it is thick. I used medium silver solder paste to attach the first end cap to the tube - this is my set up. After pickling - you can see that the excess overhang of the disc needs filing. 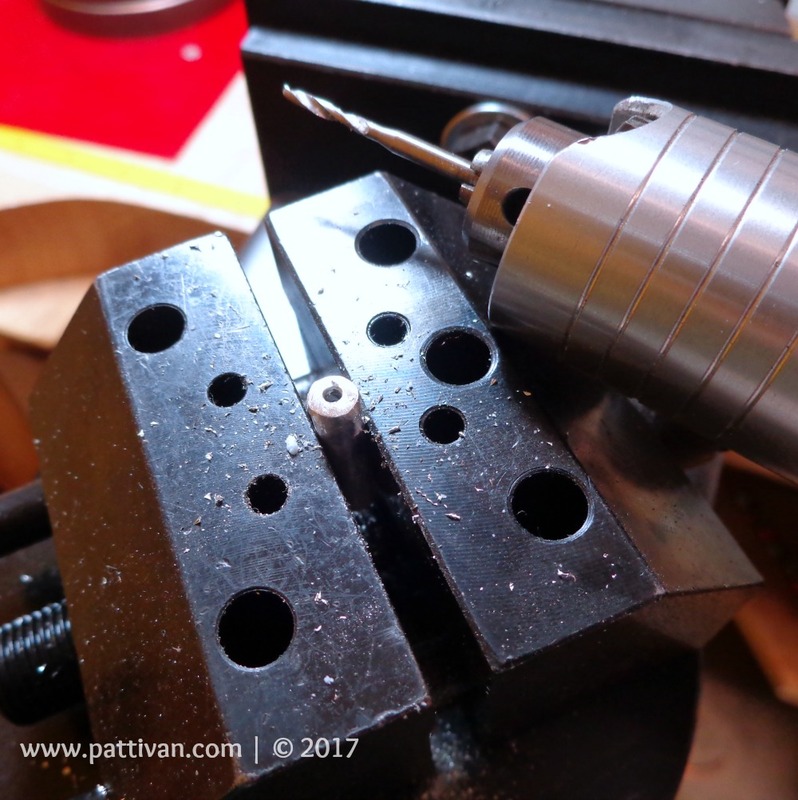 I used my ring clamp to stabilize the bead against my bench pin while I quickly filed away the excess silver. The picture below is a bit blurry, but I filed the disc / end cap to be flush with the tubing. Never EVER solder a hollow bead without first making a hole to allow steam to escape when soldering. 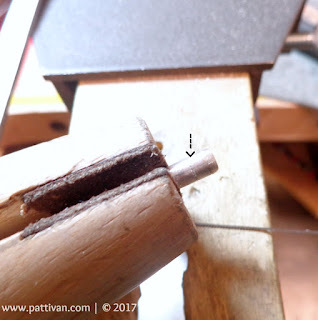 Though I have not done it myself, I have read where nasty accidents can happen if the escape hole is not in place before closing up this hollow form. 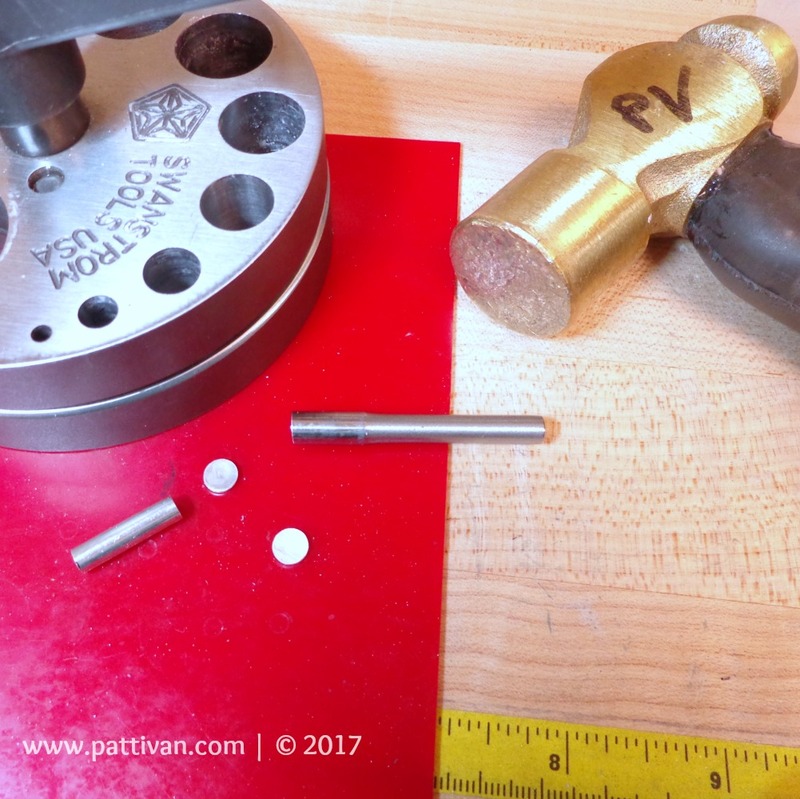 I simply put my bead in my vice and drilled a hole. Second disc/end cap solder set up. Pickled, then filed the second end cap / disc flush to the tubing/bead, and drilled the final hole. Really hard to see in this picture, but I scored two parallel lines close to the ends of each bead, using my jeweler's saw - again using my ring clamp to hold the bead while sawing. Now - this next step is the reason I used thick walled tubing. 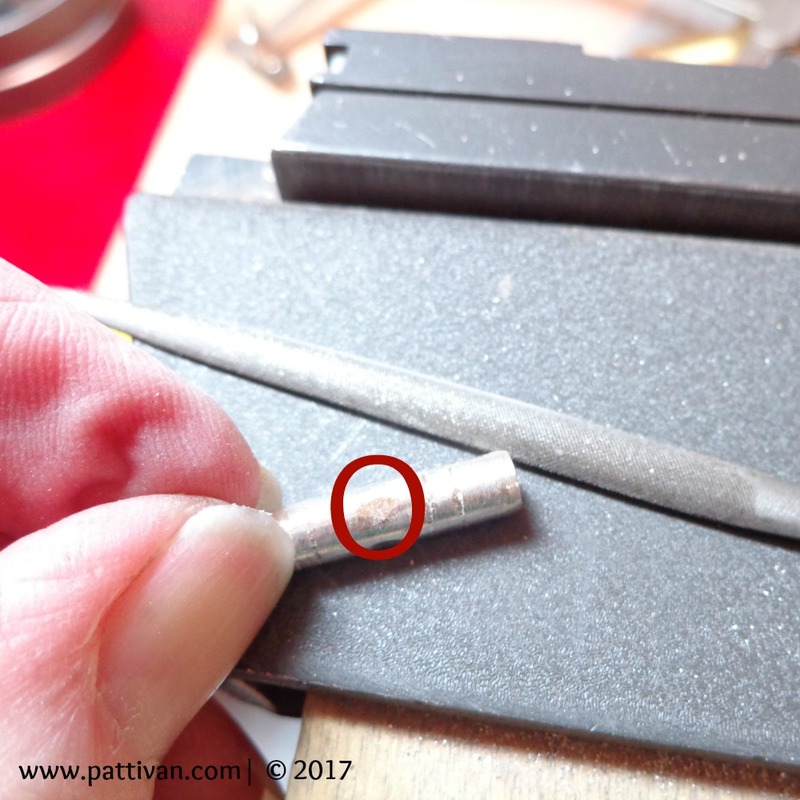 I used my tiny half round file to make four slight indentations around the middle of the bead. I cleaned up the the bead with a pumice wheel on my flex shaft. (These are the pumice wheels I use). Patina added (I use Midas Black Max - link here), buffed with steel wool, and tumbled. Liver of Sulfur works just as well, but Black Max is quicker and does not stink. :) Always a plus! 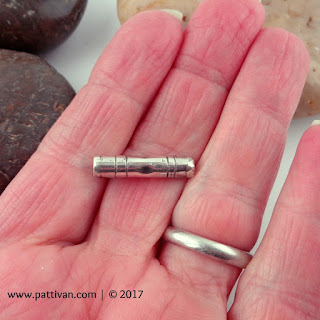 Now, this is not a perfect bead, but I rather like the organic look to this shape - would look great as a single bead on a bracelet, two beads for earrings, or even an entire chain if you have lots of time on your hands to create! Total time to make this bead for me (not including tumbling) was about 30 minutes. So, while this technique is a bit time consuming, it is handmade and definitely not made in China! Anyway, the making of this bead was the bit of inspiration I need to kick off this brand new year. I wish you all a very Happy New Year! Happy Holidays!!! I hope each and every one of you had a lovely weekend filled with family, friends and fellowship. 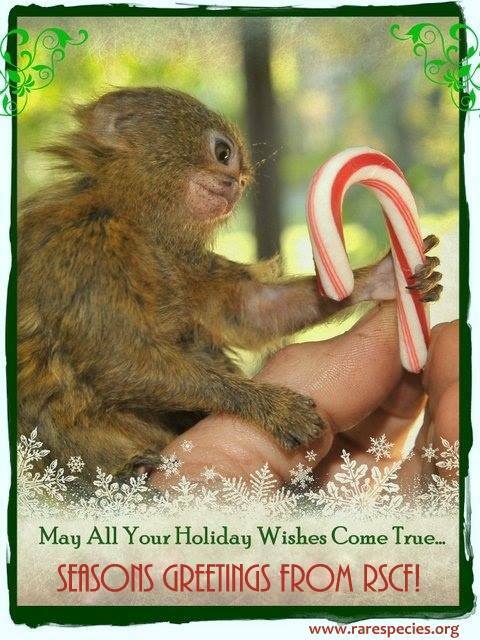 I bring you Holiday greetings from Ninita, our deaf pygmy marmoset. As you can see, she got just what she wanted...candy. 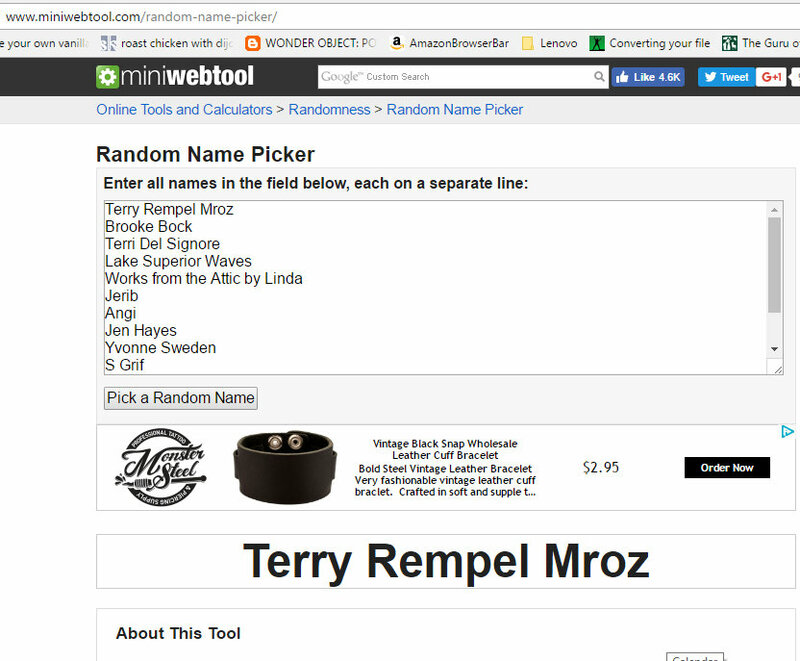 Congratulations, Terry! I'll be tracking you down as soon as possible. Hope you like the Beast! Thanks to all of our followers and supporters. I wish us all a fabulous new year full of creativity! See you next year! !